TOPS gps is a GPS fleet tracking tool integrated with TOPS to offer an active visual dispatching system. With this integration tow dispatch data, including Unassigned calls, Assigned call locations and call destinations are available for viewing on a common map with your tow fleet. Having this type of data allows operators the ability to assign the closest available tow truck to unassigned calls and or identify the truck which will complete his current job in proximity to the next unassigned call. In addition, users are able to see the current dispatch status on the map in order to guage current productivity. 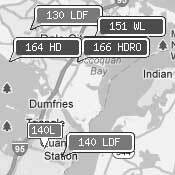 Used by tow operators for visual dispatch and vehicle tracking. Requested by municipalities for monitoring of contract tow operators.